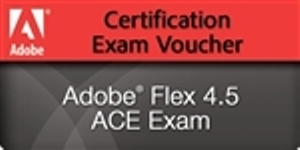 This Adobe Certified Associate (ACA) exam voucher may be used for any of the ACA exams (Photoshop, Dreamweaver, Flash, Premiere Pro, Illustrator or InDesign) in versions CS3, CS4, CS5, or CS6. It may be redeemed at any of the 12,000 Certiport Authorized Testing Centers worldwide that offer ACA exams. Use the Certiport Testing Center Locator to find the testing center nearest you. Testing centers reserve the right to charge a proctoring fee. The Flex 4.5 ACE Exam tests your knowledge of developing Rich Internet Applications using the Flex SDK, interacting with data sources and servers, programming with Action Script, as well as creating desktop applications using the Adobe Integrated Runtime (AIR).